View from where I sat. On 6th March 2014, I was invited to cover “Galeri Ariani : An Exclusive Preview” gala hi-tea and fashion show to introduce Ariani’s 2014 Collection at the Grand Ballroom of Double Tree Hotel by Hilton. 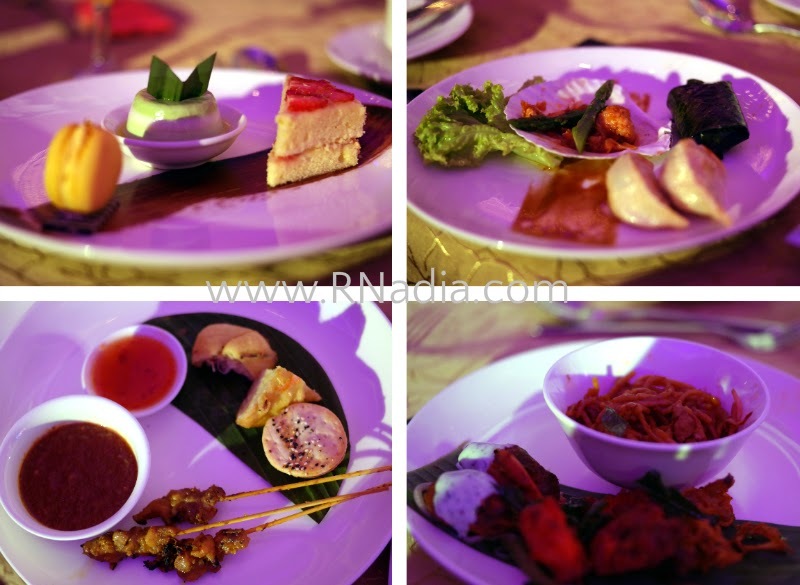 The bloggers invited to cover the event were treated as media, and honestly to me, I was (pleasantly) surprised that bloggers are now being given such recognition and respect, although I don’t think I’m worthy. I went with my SIL Syahira Zakaria and was seated on the media/bloggers table which was just next to the VIP table where the Jakel representatives (read : bosses) were sitting together with Wardina. Thankfully there were a few familiar faces on my table. Table No 16 L-R : Jezmine Blossom , me, Syahira Zakaria, Shazwani Hamid, Izzati Ghafur , Sabby Prue & Fatin Suhana. Thank you to Bro Framestone for taking this picture from my camera. He had to go so far away! Truthfully, I was very excited to be invited to cover the whole event. The event went smoothly and had wonderful surprises all the way through. There was never a dull moment at all. Oh, and the food was good too! Anyway, Ariani started their operations since 2008. Currently with 20 branches nationwide, Ariani is owned by Jakel Sdn Bhd, the huge textile company founded by Mohamed Jakel bin Ahmad in 1983. As of now we were told that they have more than 1000 various scarves designs and that Ariani started and popularised the “tudung awning”. The Marketing Director of Ariani Textiles Puan Norhana Sharkhan (Puan Nona) giving her speech representing Datin Farah Haryani wife of the MD of Jakel Sdn Bhd who's due to give birth any time soon. The first segment featured a collection which was described as “Chic Casual”. Zafira Printed, Selendang Embroidery, Selendang Printed Stone, Selendang Crumple and Aleesya Beaded Block Heavy. The collection of shawls were designed to be casual and practical. As for the collection for the second segment, “Glam Exclusive” it was aimed for young professionals and shawls suitable to be worn for formal events. They featured tudung Zafira Lace, Selendang Art Work, Selendang Stone, Selendang Embroidery, Selendang Lace, Tiara Chiffon 2 Layer and Selendang Aleeysa Lace. For the 2014 collection, Ariani focuses on the quality of the fabrics used. They use imported Italian Chiffon, Italian Lycra or Thai Silk and other facrics from Japan, France, Turkey, Germany, Italy. They also use Swarovski crystals, lace, beads and embroidery on their shawls. Yes, somehow the lighting in hotel ballrooms nowadays make our faces purplish. Hehe. The gorgeous Wardina Safiyyah has been the ambassador or the face of Ariani for 10 years. She has been with Ariani since the early beginnings, or the baby steps of Ariani. During the event she told us that she will be migrating out of Malaysia to Australia. After the show I met her and asked her when she will be leaving she said probably in June this year. It’s good to see her again as we usually meet during talks and events. Such a beautiful, humble and down-to-earth personality. Malaysia is surely going to miss this sweetheart. To replace Wardina, Ariani has chosen Nurul Syuhada Nurul Ain as the new face of Ariani. She is a TV3 personality who’s popular through the show Majalah TV3 and won the Malaysia Top Host competition in 2005. Official photos collaged by me. She appeared on stage for the second time and it was announced that she was made Ariani’s icon and that she has collaborated with Ariani to come up with a collection of scarves from Siti Nurhaliza by Ariani which will be out on 21st of March 2014. This was the surprise third segment I told you about (above) as the models with the white kaftans then paraded shawls from the Siti Nurhaliza by Ariani Collection. Jakel and Siti Nurhaliza are also working on a ready-to-wear clothing line collaboration scheduled to be launched after Ramadhan. After the event I managed to get a picture with the ever so humble Siti. While she was being ushered by the guards who were doing their job and trying to rush her off, she told the guard that she wanted to let me have a picture with her. It was so nice of her to do so amidst all the rush. Siti wore one of the designs from her collection. I really like that one and hope I can get hold of it when it’s out! Thank you Iza of The Pink Stilettos for this photo!! During the event, 66 lucky loyal customers of Ariani won prizes for the lucky draw. The lucky winners won themselves iPhone 5S, Iranian Exclusive Carpets worth RM5000 and RM1000 vouchers to shop at Ariani. Yes, Iphones! Official photo. One of the 3 sessions of the lucky draws. So many lucky people!!! There was also an auction session which to me was quite exciting. 3 exclusive only-ones-in-the-world shawls with French lace and Swarovski crystals were up for auction. Amazingly, the bid started at RM1000. The first was sold at RM3000 plus, the second reached RM7000 and the final one reached RM10,000. It was really fun to watch as guests went bidding for the 3 exclusive designs. All the proceeds to the auction goes to charity. After the event ended, I attended the press conference where bloggers and other media were invited to know more about the collaborations, future plans of the brand and the collections as well as ask questions. One of the interesting things I found out was that Jakel had taken legal protection over their products. Their designs have been patented and registered not just locally but also internationally. According to Dato' Mohamed Feroz Mohamed Jakel (Managing Director of Jakel Sdn Bhd), the designs have even been registered in the UK to prevent people from copying their designs. Right after there was a signing ceremony between Dato' Mohamed Feroz Mohamed Jakel and Dato' Siti Nurhaliza. Syahira took the photo below of what I wore that day. I wore my own design, the Electric Blue Swan from ARNADIA. Will share with you all the full details of my outfit in my next post ya? To be honest I have never worn an Ariani piece but I was lucky to receive one in my goodie bag in the exact same colour of blue I wore that day. I tried it on as soon as I got back home and I loved that the size and design was just right on my face and loved the intricate detailings on the beadwork too! Perfect. I even received a detergent specially for shawls in the goodie bag!! All in all, I had a great time at the event. 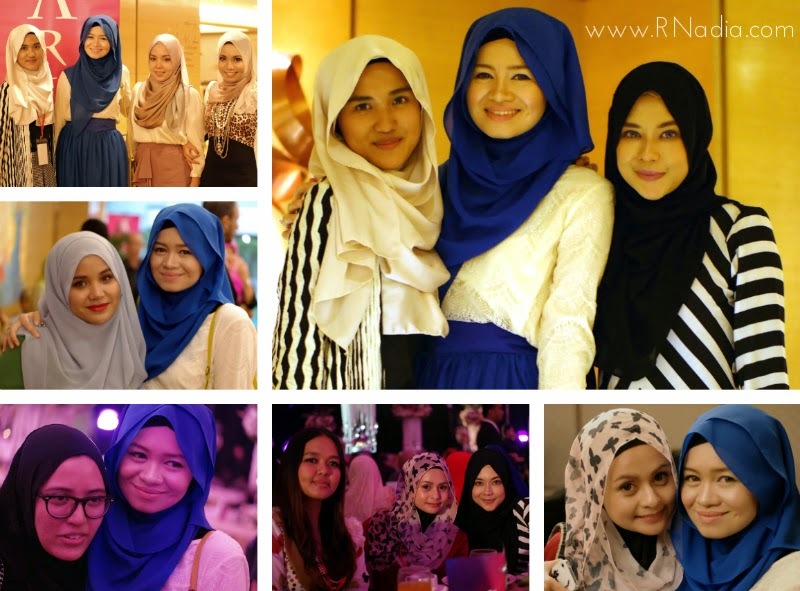 I was happy to meet fellow blogger friends and new found friends Fatin Suhana, Ami Schaheera, Jezmine Blossom, Aishah Amin, Iza of Pink Stilettos, Shazwani Hamid, Tatie (Izzati), Sabby Prue, Dena Bahrin, and many others. The Ariani representatives and staffs were all very helpful, pleasant and friendly throughout the whole event. I took a lot of photos that day. My SIL also helped to take photos with me in it. However, for this post I used some of the official photos (those which are not watermarked) to give you better photos of the event. May God grant success to Ariani and Jakel and reward them abundantly for all their hard work and efforts. Sorry baru perasan ada kredit title disana.